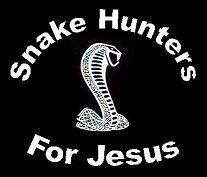 Stiff-Necked And Hard-Hearted Christians - Beware! It is with great sadness that I write this sermonet entitled “Stiff-Necked And Hard-Hearted Christians – Beware!! !” And of course the reason for my despair is that far too many of those who I’m called to disciple fit into this very same category. In other words, if I were to call out the names of those who I personally minister to, that claim the name of Christ but yet refuse to “hear God and obey God” in all their ways, the list would be very, very long indeed! So were you able to put those two Scriptures together and come up with God’s “WARNING to the fool-hearted”? Well the way it works is that in the first Scripture we have Brother Peter’s warning to the Christian to “hear God and obey God in all things”…because Satan is a “roaring lion” ready to “drink down” (devour) all those who don’t! Then in the second Scripture we have Brother Paul turning this same “roaring lion” loose on one of those “sinning saints” who has refused to “hear God and obey God in all his ways”…and he did it as a means of driving him into a walk of “total submission to the Lord”. ‘And will rend the caul of their heart’ - Every savage beast goes first to the seat of the blood when it has seized its prey; as in this fluid they delight more than in the most delicate parts of the flesh. So now do you get the picture? Well when it comes down to this “roaring lion that devours (drinks down) it’s victim”, it’s truly the “life” of the victim that it drinks…as in the marrow that produces the blood, and the blood itself! So now do you get the picture of “Satan seeking whom he may devour”? Well let me help you see it just a little bit clearer. Because you see our first example of a Christian who did not “humble himself under the mighty hand of God” is Elijah Gardea. “Elijah!” What a name!! What a calling!!! And just where is this great prophet of God right now? Would you believe back in the streets, pushing a needle into his veins! So is Elijah Gardea being “sober and vigilant” in his walk with the Lord? I don’t think so!!! So are you ready for this one? Well believe it or not but the real-life character of this real-life story is a man by the name of Elijah who had a lovely wife (Maria) and three adorable children. The first day I met Elijah was the day he came into the Rescue Mission after the bottom had dropped out of his life. He no longer had a place to call home, and his wife was on the run (AWOL: left home without permission). And seeing how the "powers to be" had temporarily put "Elijah and kids" in the chapel until more room was available, I had the awesome opportunity of getting to know Elijah first hand. Now, as it turned out, Maria came back to Elijah and the six (6) of us became real good friends. In fact our "friendship" was actually a whole lot more because I had been called by God to disciple Elijah as a Brother in Christ. Well as time went on I was privileged to hear the story of these two childhood sweethearts - Elijah and Maria - who I so appropriately nicknamed "Bonnie and Clyde". And the very good reason that I did it was because of the fact that Maria and Elijah had lived a life full of drugs, alcohol, and mischievous deeds...in fact so much so that they were always just inches short of losing their lives! In other words, whatever evil they did in life they did it to the max; defying death by knowing when to stop. Now to give you a just a few more of the details on “Elijah and family”, our initial meeting took place in the later part of 2002. I was “homeless for Jesus” when they walked into my life, living in a homeless shelter and working as the assistant chaplain. My “bond” to “Elijah, Maria, and the kids” was instantaneous and rock solid. I truly loved this family like none other. Without a doubt, it was a God thing! There is no way possible for me to explain what I saw in this family, but in simple words it was beautiful: a father, a mother, and three very special children. In fact seeing how this family didn’t own a car, they would do a whole lot of walking. How well I remember seeing Elijah and Maria pushing Cathleen in her stroller with the two boys in toe. What a sight to behold – the perfect family. Who would ever think that Elijah and Maria had such a demonic past. Well things started to turn around for the Gardea family that day when Elijah and Maria walked into the Rescue Mission and gave their life to the Lord. God started speaking to them in a supernatural way. They became empowered from on high to overcome the spirits of darkness that had worked so hard to destroy their life through drugs, alcohol, and mischievous deeds. So the Lord started blessing them. Both Elijah and Maria found part-time jobs, and then an apartment only a short distance away. We continued to fellowship and pray together through regular meetings, and then the Lord instructed us to go out and minister. Elijah and I went on a few assignments, and it was truly awesome to see God developed him as a prophet. What a Word! I could feel the power of it every time I reminded Elijah of the work that needed to be done for Jesus. But the days turned into weeks and Elijah never found the time. And then came the day when that “roaring lion” appeared in the Gardea family. Because you see one day, on their return from Mexico, the U.S. Immigration pulled a check on Elijah…and what they found was a warrant for his arrest. Now unbeknown to me at the time, it was only a few days later that I went by to pay them a visit. However, what I found was not what I expected. You see when Maria answered the door she immediately burst into tears and buried her face in my chest. Through heart-breaking sobs she told me the story…of how Elijah was arrested and the Social Service took custody of their children. What a mess! And on top of all that, her apartment rent was due but she didn’t have the money to pay it. What was she going to do? Well after seeking the Lord in prayer, I was directed to make a call and arranged for a place for Maria to stay. This I did, and Maria agreed to the arrangement. I was to pick her up and drive her over to her new home later on that day, but when the time came Maria was no where to be found. Well, it was the next day before I finally got Elijah on the phone, but what a blessing it was! We only had about fifteen minutes to talk, but during that short time I was able to get the skinny. His three children are living with his aunt, he divorced Maria because she went back on the needle, and he is now married to another woman. He went on to say that he served his time for the warrant and was released from prison about a year ago. During his lock-up he prayed for me daily, spiritually discerning that I was going through some very hard times. And amazingly enough, he had even managed to keep a small picture of me as a daily reminder of the Brother he was praying for. He confessed to me that he was back on the needle, and I reminded him of his failure to obey God in all of his ways. I then asked him if he was ready to get back on track with Jesus, but his heart-breaking reply was “I’m not ready yet”. So as instructed by the Lord, I then asked him if we could meet “downtown El Paso” at the park. I told him that the Lord had given me 1:00 p.m. as the meeting time, but he needed to pick the day. He agreed to meet the following day (Tuesday), and that was the last I heard from Elijah. Because you see it was the next day that Brother Alan and I arrived at the park a few minutes past 1:00, but there was no Elijah to be found. In fact, as the Lord directed, we waited for an hour and a half before leaving…but there was no Elijah to be found. What a shame! I didn’t even have the opportunity to give Elijah the “Word from God” that applies to his life. Because you see what the Lord had instructed me to do was give him a copy of our most recent sermonet “Evil Lording Husbands!”, and also share with him the newspaper clipping entitled “Fingerprints link 2 men to slaying”. Now as the “Evil Lording Husbands!” applies to Elijah, it was his disobedience to God Almighty that caused the problems in his family. In fact he had no right to divorce Maria for “going back on the needle”, because it was his disobedience to the Father that caused them to lose their children, that caused her to get the blame, and that likewise caused them to separate. The finger points at Elijah…and the buck stops there! That was “Part I” of God’s message to Elijah! Then “Part II” consisted of the newspaper clipping that told the very gruesome story of yet another “stiff-necked and hard-hearted Christian” like Elijah…and what it took to bring him to his knees before the Lord. Because the man who was murdered was just another Brother in the Lord that Elijah and I both knew. His given name was Abelardo but we called him Aaron. I first met Aaron at the Christian Home shortly after becoming homeless for Jesus. Aaron was a very kind-hearted man who God had called to minister to the youth. Aaron was called, but Aaron did not answer the call because of his demons. You see Aaron, like so many others, was not able to overcome the dark spirits in his life because he wasn’t willing to “hear God and obey God” in all things. Aaron had a drinking problem, and Aaron had a drug problem, but the biggest problem Aaron had is what kept Aaron from walking in obedience to the Lord. You see during the months that I knew him, the Lord gave me many words of encouragement for Brother Aaron. I reminded him of the special gifts that the Lord had entrusted him with, and I also reminded him of the things that God was instructing him to do that he wasn’t willing to do. And then came that fateful day when Elijah, myself, and a few other Brothers from the Rescue Mission went over to the Christian Home to pray. As instructed by the Lord, it was upon our arrival that I invited Brother Aaron to be a part of our prayer meeting. I asked, he accepted, and what happened next was awesome. Because you see one of the Brothers in our group was a young boy who had recently accepted Jesus. And it was during this particular prayer meeting that the Lord chose to “anoint him for service”. The Holy Spirit moved in a great and mighty way that day, and it moved on Brother Aaron to prophesy over the young boy’s ministry. That was truly the moment that I saw how God wanted to use Aaron to minister to the youth. The fingerprints of two robbery suspects linked them to the slaying of a 50-year-old man found Sunday in a Lower Valley ditch, court documents stated. Noe Moreno, 25, and Francisco Mora Sanchez, 37, were charged with capital murder for allegedly beating to death and robbing Abelardo Jaloma, whose body was found at 6:48 a.m. Sunday by Border Patrol agents checking a canal system in the 6900 block of Delta Drive. Jaloma, of the 7600 block of Franklin Loop, was found lying face down in a pool of blood with his feet bound and hands tied behind his back, according to a complaint: affidavit acquired Wednesday by the El Paso Times through the Texas Public Information Act. Jaloma’s pants pockets were turned inside out. 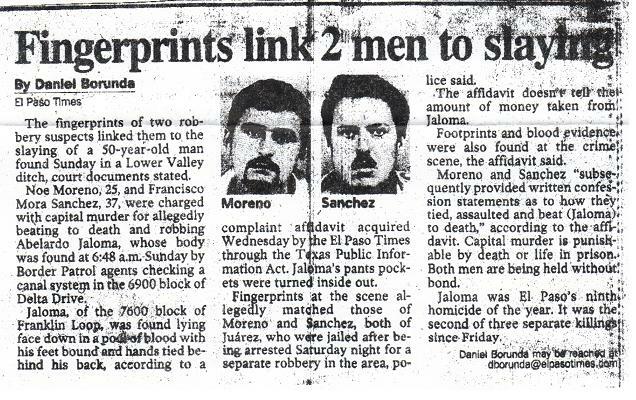 Fingerprints at the scene allegedly matched those of Morreno and Sanchez, both of Juarez, who were jailed after being arrested Saturday night for a separate robbery in the area, police said. The affidavit doesn’t tell the amount of money taken from Jaloma. Footprints and blood evidence were also found at the crime scene, the affidavit said. Moreno and Sanchez “subsequently provided written confession statements as to how they tied, assaulted and beat (Jaloma) to death,” according to the affidavit. Capital murder is punishable by death or life in prison. Both men are being held without bond. Jaloma was El Paso’s ninth homicide of the year. It was the second of three separate killings since Friday. 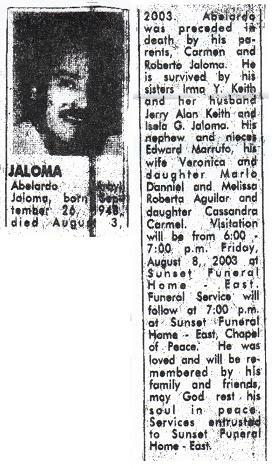 Abelardo (Arby) Jaloma, born September 26, 1948, died August 3, 2003. Abelardo was preceded in death by his parents, Carmen and Roberto Jaloma. He is survived by his sisters Irmo Y. Keith and her husband Jerry Alan Keith and Isela G. Jaloma. His nephew and nieces Edward Marrufo, his wife Veronica and daughter Marlo Danniel and Melissa Roberta Anguilar and daughter Cassandra Carmel. Visitation will be from 6:00 – 7:00 p.m. Friday, August 8, 2003 at Sunset Funeral Home – East, Chapel of Peace. He was loved and will be remembered by his family and friends, may God rest his soul in peace. Services entrusted to Sunset Funeral Home – East. So, you tell me: do you think Aaron made it into Heaven? Well that was the question that plagued me from the time I heard of his death until July of 2005 when I received a copy of that El Paso Times newspaper article. Because it wasn’t until I read all the gory details of that article that the Lord finally gave me the answer to my long sought-after question. So, is this message for you? Are you a Stiff-Necked And Hard-Hearted Christians?? If so, what size hammer do you really want God to use??? In other words, what’s it gonna take to knock you to your knees in total submission to the Lord??? ?